As a long-practicing weed smoker, nothing seems to smooth over the anxiety of meeting hundreds of new people a week like a nice J after a show. In recent years, some state legislation has blessed us with dispensary pit stops for our weed fix (Colorado! California! ), but most places still feel like the Wild West in that regard. I have been touring in bands for over a decade now, and I have had some pretty weird/dire/embarrassing hunts and experiences looking for chronic. Also, as a personal exercise, I am going to try and use every synonym for “marijuana” that I can while recounting these tales. On Tacocat’s very first tour, we played a record store show in the perfectly quaint town of Red Lion, Pennsylvania. It was all brick shops, cobblestones, and sincere townsfolk. Unfortunately, we’d run out of our modest nug supply and were looking for more. A guy from the show kindly passed along his dealers’ number, and we made a plan to meet up with them in the parking lot of the mall outside of JC Penneys. We pulled the minivan up to the only vehicle there—a blue Jeep—and hopped out to meet them. To our surprise, they drove up 30 feet ahead and immediately called us: “Hi, sorry guys, the deal’s off. We think you are cops.” They hung up and drove a little further away while we sat there surprised. After calling them back, we convinced these inexperienced young ganja dealers that the minivan was full of musicians, not cops. That’s how Red Lion, Pennsylvania became our first tour score. In theory, SXSW in Austin would be a great time to buy some jazz cabbage: You are in the most liberal city in Texas for a whole week partying with all your friends, and in between playing several hot weird outdoor shows a day, you usually wanna toke on a little something. One such occasion, my bandmate and I were getting drunk on Lone Stars when we were offered the sale of a twamp for a way hot $10 deal. When the dealer pulled it out, it was an enormous amount, and we couldn’t believe our luck. Unfortunately, being unfamiliar with what is referred to as “Texas dirt weed,” or schwag, we spent the next 3 days, cotton mouthed and red eyed, smoking this atrociously dry weed. We tried to pretend to love it so as not to waste this enormous bag, insisting on telling everyone who would listen that we were the “Schwag Queens of Texas.” After we started losing our voices, we finally tossed the mega bag of Sinsemilla, never to return to its headache-inducing clutches. In the Southwest between Phoenix to Texas, roads are riddled with “border checks” which supposedly exist to check for US citizenship, but the officers commonly use intimidation tactics to search your vehicle for contraband—often demanding to do so if one of the drug dogs so much as sneezes. Anything can be twisted into an excuse, and as many of our band friends have learned, Arizona is particularly harsh on marijuana. We never carry it into such aggressive states. The band we were on tour with, Forever, explained that they have a “no riding dirty policy” in their van, and it stuck in my head as a funny reminder to ditch the weed. They spent the next hour tearing apart suitcases of dirty socks, making us late to sound check, telling us if we had ANYTHING hidden in our amps, their dogs would tear it apart. I usually get stressed around cops, but I was so high, I just said, “Go ahead and keep looking, officer, but I should tell you that we don’t ride dirty,” in a way that clearly indicated I was thunderbaked out of my mind but that we were not carrying anything. He glared at me hard, and after poking through our van one more minute, he let us go. So don’t miss out! Come join us for our Halloween Haze party with Bree and her band Who Is She? on Friday, October 26, beginning at 6pm at Stone Way Cafe. Who Is She? 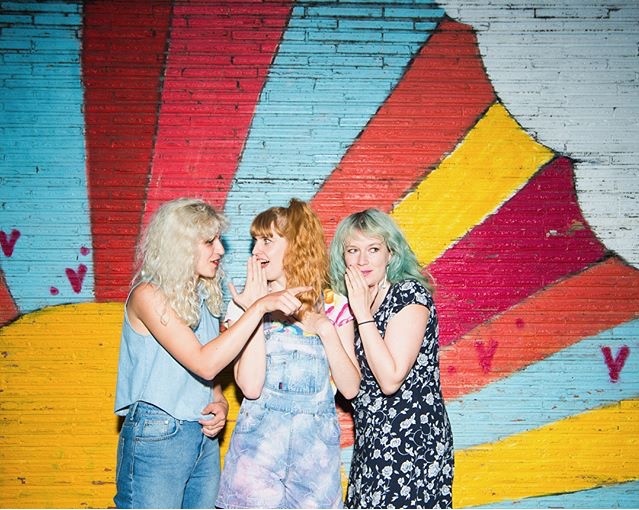 It’s Seattle's newest supergroup with members of Chastity Belt, Tacocat and Lisa Prank! Started as a friendship project writing songs based on the missed connection ads from Seattle newspaper The Stranger when Robin Edwards (Lisa Prank) and Bree McKenna (Tacocat) were living in bedrooms next door to each other at legendary Seattle punk house Spruce House, the two Seattle music celebs then enlisted another gal with a lot of free time on her hands, Julia Shapiro of Chastity Belt, to play the drums. The songs then expanded from lonely ditties about admiring (but not talking to) strangers on the bus to other hard-hitting topics like the magical chemistry between Courteney Cox and David Arquette in the Scream franchise, ‘90s internet time traveler John Titor, fictional My So-Called Life dreamboat dud Jordan Catalano, and the brutal ranking system of friendship on Myspace. 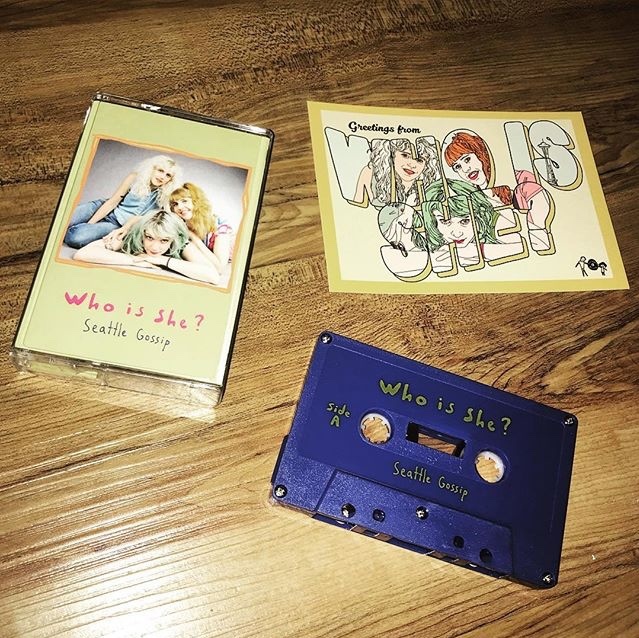 Inspired by Canadian cuddlecore sensation Cub and the silly inside joke holes you go down when you’re constantly hanging out with your pals, Who is She?’s Seattle Gossip is a star-studded, all-killer no filler addition to the booming Seattle music scene canon.